I'm a sucker for a statement skirt...and even bigger sucker for a sale! During the 4th of July weekend, Kate Spade was having a HUGE sale, and I was able to snag this adorable cityscape skirt. The pencil skirt features the city of Havana, and the adorable pastel colors add the perfect amount of whimsy to this chic ensemble. simple black razorback tank top. 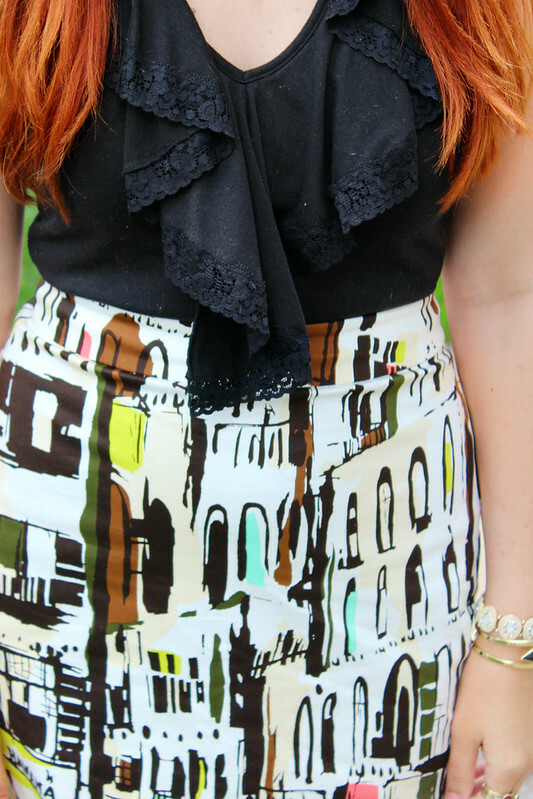 I just can't get over the gorgeous details of this "hand painted" style skirt. It's one of my all time favorite Kate Spade pieces. It also comes in a full flair dress, but I think the pencil skirt is just the right amount of whimsy; while the dress looks a little "too busy". The subtle lace details and ruffle on the top give the whole look a feminine touch. This skirt makes me want to travel to Havana. How about you?